In this solution, we'll show you all the quests available to complete catches in the DLC Hakkon. 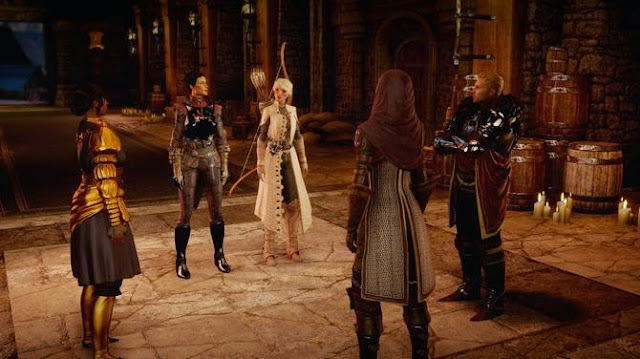 The additional content for Dragon Age 3 - Inquisition includes a completely new area and a variety of tasks. Of course, waiting for a boss fight and a mighty dragon on your group of heroes. The emerging field of DLCs you reach over the planning table in the firmament. For eight power points which you can, located in Ferelden to unlock area. You will meet again on Scout Harding and Professor Kenric, who tells you about his discoveries. An island is to be explored by you. Go to the destination point and help the fishermen against the Hakkoniten. After that you can borrow his boat transfer to the island. Then go to the cottage on the hill. Speak with the spirit and collect the remains. You gain a strong arch and a new Inquisitor capability. Speak now or with Kendric about your findings. If you have already done some side quests and helped the Avvar, you will now be piloted in the north. From this place the mind on the island has spoken. Once you arrived, you will encounter enemy. Concentrate Always on the shooter. Then wait on Harding and Kenric and explore the area. To get past the barricade use veil fire. With this you also looking for two runes inside. Activate the lever on the outside wall and then on the big platform to enable the crossroad. Continue to the next destination. Once you have the fortress exposed, start the next quest. The fort can only assume using the Avvar. To do this you first need to fulfill some of his tasks and talk to the leader. She plans a raid on the gate. Beat the enemy back there and get inside. Now go to the temple. There, you have to run from fire to fire, so as not to freeze to death. First, go to the left at the top of the hill and take care veil fire. Then back to the beginning and through the door on the right. There you will find the key. Now go through the door and see the danger. The fight is much harder, but still doable. Concentrate. Always on the minions of Bosses and invigorates your colleagues as quickly as possible when they fall you have done it already stand at the next quest. This quest gets you after you have spoken with Inquisitor Ameridan. The dragon has freed himself and makes the sink uncertain. Now it is up to you to stop him. The fight is pretty hard, and should be tackled by a well equipped and trained group. Hakkon misses ice balls and freezes you a with his breath. He also calls always small servant who support him. These have to switch off its fast or can take over from the tank. This fight commences only at level 24 or higher. Ameridan has left you some locations of memories. With these you learn more about the life of the last Inquisitor. Just Run up the five points from the map and the quest is done. These give you bonuses that will help you in the fight against the dragon. The Baron gives you this quest north of the main camp. Wildlife prevents his expedition. You shall mixture herbal at four points placed so that they are scared. Along this task you will find also the writer of the Barons, who will give you an additional task. Set the four herbs for this quest and it's done. The Baron seeks a mysterious beast in the valley. Now you have to find evidence that it exists. You can find them in some Gurguts along the river. Collect them and take them to the Baron. He asks you now to cast the bait again and you put the Nox Morta. The beast has very much life. So you direct for a long battle. In addition, you should take care of his attack that peels also a lot of energy. Do your group so that they don’t stand in a row. After a few minutes the battle is over and you can Baron report. The tribe of Avvar located in the far East along the rocky coast. Here you can talk for a climbing competition with the tribal leader. She tells you of the tribal animal that has been missing for a few days. The Quest is completed after the conversation, but now you have to gain reputation with the tribe. To impress the stone bears, there are several possibilities. Meet example, the quest the outcast and you get a point when Siegrid returns to the trunk. Hakkon tests also give a point. Easily meet all side quests in the area in order to accomplish this task. The tribal animal of the stone bears is missing. This tells you the Tribal leader for a week. Go to the two marked points and collect evidence of his whereabouts. Then you will find the bear in a cave in the valley. This is at the end of the river in the east. Slay the Hakkonisten in the cave and freed Storvacker. He follows you now. Now kill the enemy outside the cave and return to his tribe to complete the quest. At the destination point reach, you will meet some Havvars. They are level 20 and give you a foretaste of the area. About the Karpacz right you have a height advantage. The archer can freeze you with their arrows. So try not to let you take too much. Have you managed to speak with the leader of the camp and you'll get the next task. The leader of the camp reported Hakkoniten in the area. These bearings you have to fumigate now. In principle, this quest as the previous one expires. Only now you have to rely solely on your group. Once you have levele it properly within the main adventure, fighting should not be a problem. Concentrate only on the shooters ever since these hamper the fight against big opponents. Then return to lieutenant, to complete the quest. Then there is a new task in the main camp at Scout Harding. Harding missed another scout. Look for him at the specified destination. There you can explore the area and find some deaths. Now follow the trail of dead bodies and you come to a cave in which the scout is. He is possessed by a demon. Now you decide whether you will do the demon or fight for you initiated. He has a lot of life points, but hands out little damage. It can also drop a Fire rune for you. No matter how you decide: Report Harding then it and the quest is done. Sigrid, the outcast can be found in the cave in which scout Grandin is. She wants to be left alone. However, the Inquisitor is curious and wants to know why she has exhausted herself. Speak her with another member of the tribe. The trunk of the stone bears can be found in the eastern part of the area along the cliffs. In the upper part you will find a hut. There is the Augur, which tells you about the ritual with Siegfried. Then you go to the south, there to attend the ritual site. Examine there the four points and go back to Sigrid. Now you can convert them to seek help at the root (+1 prestige) or an emissary of the Inquisition to be. A ritual for the burial of some dead should be completed. For this, you need some ritual objects that you can ask her the Master of the Hunt. The son Caldans was not in a position to offer up. You can also ask it to her as to why this is the case. In three places in the area you will now search for non-contact creatures and finish them off. Then bring back the gifts and the quest is complete. In the village of stone bear warriors want to play against you. Speak with instructor Arken at the top level. You must first offer him a small tribute that after so many hours of playing time but should not be a problem. Use the height differences of the arena to your advantage and pick you single out weak targets that will do it quickly. Once you survived three bouts, you get a reputation point and the quest is done. Kenric research partner is at the Tevinter ruins. You should talk to her to get new information. You can find them in the east valley. Do the fight and then speak with her. Then you shall meet at the ruin in the north. There you reach after a short walk up the mountain at the cliff-stock. At the end of the stairs is Colette. Speak with her and the quest is completed. The lady at the fishing hut looking for Runa. She should be located on the hills in the north. Follow the instructions at the top of the climbing walls and you will find the base in a fight. Support them and live with prayer. Even the quest is completed. In this area there are again numerous cracks that you can join it with the Inquisitor. , Noted, however, that these can include spirits and schemes of stage 23. It is therefore necessary to be on the road already, with fully equipped group. Apart from the main camp starts in the trip it yours, there are five other peaks in the frost sink. Look at your map and you will see the grayed position there. Now simply run off the shelf and activate it. In the course of this zone will give you quests anyway to get past some.